Monitor Collection - Best Litter Receptacles Inc. 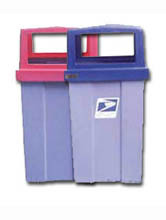 This 40 gallon receptacle is light weight but durable, made of tough rotary molded polyethylene. It is suitable for use both inside or outdoors. Security clips can be provided for outside use. Poly bag liners can be tucked easily at the top and remain hidden under the lid edges to maintain a neat appearance. Choice of variety of colors. 22” x 22” x 33"
22” x 22” x 39"